Tom Natan from First Vine Wine Imports has been very patient with my schedule and we are talking in August and I am just posting it today in February! Thanks I’ve been listening to a few of the podcasts and its been really fun. I’m gonna give the credit to my guests because I love podcasting. It’s so great to meet people who think like I do. It just seems like I have been meeting a lot of different people this year. I am in fourth grade this year and the kids just jumped on the composting. Our garden is in full bloom so I’ve been bringing in dragon’s tongue beans the kids have been loving and carrots and apples and zukes for staff and parents! A chemical engineer by training after college I worked for a food product development company. So my work history at least initially was always about food and I’ve always loved cooking. don’t make it to the US. I don’t think people aren’t aware of how much wine is made all over the world. directing agencies not to enforce or not directing resources towards projects. Once something gets taken away it takes 2xs as long to get it back. Im kind of a bitter and cynical person and that was just making me more bitter and cynical. probably interested in how their wines are produced. wine is an agriculture product. Isn’t it that the 27% of the chemicals in France are on the grapes. if conditions are pretty wet then if they don’t dry out properly, if the grape growers don’t separate the leaves so they don’t get stuck together you can get a lot of fungus growing. they are not allowed to surface irrigate or even drip irrigate in most cases if they do that. How come is there a water shortage? Some techniques were perfected by the knight’s back in the 12th century. codified in the early 20th century..
after WWII they really started focusing on higher quality production and minimal chemical intervention. Youre right tho there is still a lot of pesticide use in France, mostly fungicide and the wine making sector did account for almost 20% of those chemicals. Tougher process with some of them. In some cases you have centuries of tradition. If they have centuries of tradition that’s before what we’re worried about today. They would have planted them differently . it is having an affect on migratory birds. there are all sorts of things to consider about changing the way you grow wine. Let’s talk about how you get to pick the places you get your wine. I’m lucky enough to know people that do some scouting for me in various places. I think people picture me as a wine importer that I arrive and get in a car dirt road to a battered sign and the wine maker carrying his baguette comes out to meet me. I drink a lot of wine, do you want to talk about different flavor wines? I kind of like dryer wines, not fruity wines. The thing to remember is there’s no right thing. People get nervous because they think they are gonna get judged how they taste but if you like it that’s all that matters. The hotter the climate more intense it’s going to be. Once you know where it’s grown in Europe further and further south the wines get more robust. If you are looking at wines from southern Italy the southern wines are going to be more robust and fruitier. farmer’s have to decide to pick grapes based on sugar content because if it gets to high they might not be able to ferment all the sugar into alcohol. US wines tend to be fruitier then wines from Europe. European tends to taste earthier and less fruitier. It’s really a question of preference and tradition for them. Napa and Sonoma valleys soil is beautiful. You could grow anything there. 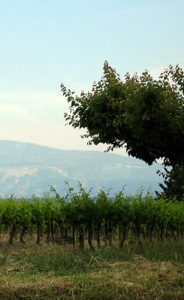 Most choose to grow wine because the soil is good for it. When you have really really good soil, you don’t have to go as far down to get which means you don’t get quite as much earthiness which means the won’t be as earthy tasting. You get a really fruity taste to your zinfandel. It doesn’t mean it’s gonna sweet when I wine is fruity we have a perception of sweetness, might taste a little jammy. If you go east to the foothills of the Sierra Nevada mountains, you have terrain conditions more like the wine regions in Europe. A lot of the farmers in the foothills there, don’t use any irrigation. You should be able to go into any good reasonably wine shop and they should be able to tell you the flavor and sweetness that your looking for. I do want to say that sweetness in wine has gotten a bad rap. White Zinfandel is an interesting thing. they had all this fruit and they wanted to make something different out of it. when you crush and don’t have contact with the juice you don’t get the color. You can really taste the alcohol. You were starting to get all these wines that were making you breathe fire when you drank them. There are some great Oregon Rieslings and some from NYState that go really well with some foods. If you taste those. Off line I’ll give some recommendations if you have I can convert you to a little bit of residual sweetness. Can I just ask you said they don’t put the skin in or they should? minimal contact with the skin. That’s how you end up with rose’s – pink wines. stay in contact for weeks before the juice is drained off. depending on seeds too if you need to increase the tannins. I just wanted to say the compounds in the grape skin are some of the things that help to determine what’s gonna with the wine. wanna get the ripest tomatoes The ones you think if I let these go another day they are gonna go in the compost. We all know that when they all of a sudden are super ripe. cut into 3/4 inch slices throw them in too. Ours grows like crazy so we always have it! Or soak it up with some bread! Tomatoes and Eggplant – to salt or not to salt? The only way to figure that out is to cut some up and taste it. if it tastes really bitter to you you probably need to salt it. I was gonna say, I like to pick zucchinis, eggplants smaller, like the size of a quarter, maybe a bit bigger for the eggplant. parchment paper works well too. parchment or non-stick mat I think that works a little bit better. good brand of supermarket ricotta they just tend to have more liquid. Ricotta cheese is really expensive in Montana. IDK why. When I get to NY I’m like omgosh how cheap that is? That can’t be? I’m always surprised at how expensive dairy products are on the east side of the mountains which seems so counter intuitive because here I’m on the open plains and there’s tons of cows and it’s so much less expensive on the west side where we live. It all seems to come from Spokane produce so that might be why, more gas etc. I want to give you more one more recipe tip but I want to make sure we talk about organic and biodynamic wines. you can put it in your pancakes too it doesn’t make them taste like vegetables but adds a savory component to your savory pancakes. I think you should open a restaurant! Were you going to tell us what kind of wine goes with the mozzarella eggplant stacks? A little secret about pairing wines with food a lot of times your pairing wine with the sauce. sauce flavor is what your are going to taste so go with that. Their mouths are probably drooling like mine and thinking about food. You should do a cookbook! we probably like to see if we can get organically produced wines. is pretty much the same as it is for other ag products except is they don’t allow for addition of sulfites into the wine. You can tell if it is oxidize it smells and tastes like sherry. also help protect the wine of too much oxygen, they are in very small qualities. if it has less then 10ppm of sulfites they don’t have to label it as it contains sulfites. this leaves out almost every wine from Europe. They routinely add sulfites, they want it to last. plenty of people against adding sulfites that say it detracts from the natural character of the wine. I respect their opinion on it. I don’t feel the same way. It’s a small distinction but I think it’s an important one. It’s not a petroleum chemical. I’m not sure what the issue is with that. to the casual observer that might seem a little odd. The thing most people find funniest is your supposed to bury cow horns with manure in your vineyards to help with grape production. What I like is biodynamics really focuses on health of soil. I think people would believe that makes sense. healthier grapes comes from healthier soil. I lost the rest of the interview? Yikes! Sorry everyone? !